History. A call I can never seem to ignore, a need to see the wisdom and the folly of the past to better understand the shape of the present. One of the things I most respect in the telling of a piece of history, wherever in the world the stage may form, is the care of the storyteller to see the participants as real people. People with real needs, real trials, and real accomplishments. My friend Edward Frank is such a person. As he will tell you, Edward is a passionate caver. He spends much of his time working toward a more balanced and sustainable treatment of the globe on which we live. From his work as a geologist to his work with the Native Tree Society, he is focused on issues and on the human impact of our decisions now and in the future. It was with great pleasure that I saw him take on this new task. I sincerely believe he can bring the stories of these past men to life. This is the story of men who suffered the ignominy of being “property,” and yet excelled in the tasks set before them. These men were explorers and conquerors in their own right and their story should be told. Please welcome my guest this week, Edward Frank. 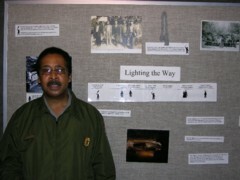 My name is Edward Frank and I am developing a documentary video about the Black Guides of Mammoth Cave. My partners in the effort are filmmaker Phoebe Frear and award winning, bestselling author and screen writer Steven Barnes. I am a geologist by training and have been a caver for over thirty years (with numerous publications), a web designer, and filmmaker. Phoebe Frear is a talented young filmmaker who has produced short documentary and theatrical videos with her production company Elephant Trunk Films. Steven Barnes is an award winning science fiction writer, a NY Times bestselling author, and a screen writer with his work appearing on numerous television series. The genesis of this project really took place several years ago. On a visit to the park I took the short walk down the Heritage Trail to the “Old Guide’s Cemetery” to visit the grave of Stephen Bishop. Stephen Bishop was a slave who was taken to Mammoth Cave in 1838, along with fellow slaves Materson Bransford and Nick Bransford. They were to serve as guides for tourists who wanted to visit the cave. In addition to his service as a guide Stephen began exploring the cave. He was the first to cross the Bottomless Pit and to see the miles of cave beyond. He was the first to see Gorin’s Dome, the first to see the Echo River, and first to discover the blind, white, troglobitic cave fish dwelling there. His exploits are legendary. As the first great American cave explorer, he is an iconic and almost mythological figure within the present day caver community. After a short walk I arrived at the “Old Guide’s Cemetery.” There were two signs flanking the viewing area. On the left side of one sign was an image of Stephen Bishop, Dr. Croghan, the Mammoth Cave Hotel, and a hut from the ill-fated tuberculosis hospital briefly located within the cave. The right side of this sign showed an image of Stephen Bishop’s tombstone. The second sign was devoted to African American Heritage at the park. It showed a large photo of Ed Bishop who is Stephen Bishop’s great-nephew. I had never really thought about Stephen Bishop’s family and had not known he had a brother, let alone a great nephew. Three photos flanked the right side of the sign. The first showed guide William Garvin and his wife Hannah at a small farmstead they owned. The second showed students at the segregated Mammoth Cave School, circa 1910. The third photo showed a mixed group of both black and white cave guides who worked at the cave in the 1930’s, prior to the cave property becoming a National Park. Who were these men? What were their stories? What of their families? It bothered me that while I recognized the name Stephen Bishop and could recount some of his exploits, I knew virtually nothing about the other guides who worked in the cave. In actuality I knew very little about Stephen Bishop himself beyond the popular caricature presented to the general public. My resolve to learn more about these men was crystallized only a few minutes later inside the park’s Visitor’s Center. I was examining some of the early photographs from the cave posted as part of a display when I met a guide working there. His name was Jerry Bransford. Jerry Bransford is the great-great-grandson of Mat Bransford, one of the original slave guides at the cave. He was the fifth generation of Bransfords to have been a guide at the cave, and the first to lead tours in 66 years. His uncle Louis Bransford left the guide service when the National Park was established. His story brought home to me how little I knew about these men. This is a piece of history that deserved to be told and had to be told. This was the genesis of this documentary project. I will strive to create a balanced presentation that both deals with the men’s tribulations first as slaves and later free men in the face of segregation and discrimination, and their accomplishments as cave explorers. I want to put a human face on these men as individuals and acknowledge the roles they, their descendants, and other African Americans have had in the history of the cave and the surrounding communities. The website at http://blackguidesofmammothcave.wordpress.com/ outlines the basic structure. The documentary would be approximately 50 minutes in length and done in the style of the History Channel’s “History’s Mysteries” and “Who Do You Think You Are?” on TLC. On January 10, 2014 an Indiegogo crowd funding effort will begin. If you are interested in the project please donate at that time. I have also created a Facebook Page: https://www.facebook.com/blackguidesofmammothcave?ref=hl and a Twitter Account: @blackcaveguides for the project. Thank you Edward. I am looking forward to watching the progress of the project and to see the finished product!